Eipix Entertainment is bringing the Amaranthine Voyage series to its end with a new hidden object puzzle adventure game. And it is good because it is hard to start a new series but sometimes, it is hard to finish one in time before it becomes too boring or a repetition of itself. All of the scenes in this new land are going to be jungle-like and Jurassic era-themed with an alien flavor to it. Amaranthine Voyage: The Burning Sky Collector's Edition is the last game of the series and it takes the main character, Eve Glover to a new adventure. It does not come as a surprise if you followed the game from the start. It seems that every archaeological dig takes her out of this world to a different dimension. That is exactly what happens here. You end up on a different planet (or land?) where two tribes coexist but are enemies at this moment. You need to unite the two to save the world. Nothing particularly new about this story. We've heard a variation of it in other games. Except there are dinosaurs here! The tribe people ride them and use as vehicles. Now that is something new and of a particular interest to some players. If only the developers exploited the theme more! As you can imagine, all of the scenes in this new land are going to be jungle-like and Jurassic era-themed with an alien flavor to it because, you see, the tribes came to this planet from space. Lots of greenery with dinosaurs here and there. Very summer appropriate! There is also a bonus chapter where you are investigating a theft of an important spell book. Looks like an archaeologist wears more hats than you would have thought! 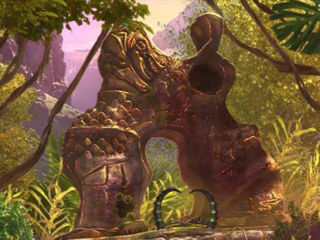 The gameplay offers a wide range of tasks and activities for you. There's isn't much innovation here but it is still pretty good. Having chosen your preferred mode of difficulty and adjusted the skips and hints to your liking, you are mostly occupied with hidden object scenes and mini games. The HOS are mostly multi-layered and interactive with a variety of search types. The mini games are decent though there isn't going to be anything you haven't seen before. Both are replayable as part of the extras(13 HOS and 21 mini-games). 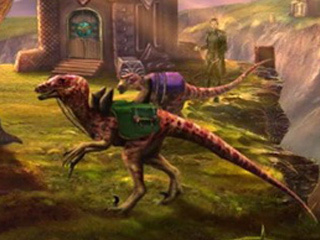 Other CE bling elements are dinosaurs hidden across the game. You collect them for your souvenir room. There are 12 achievements to earn throughout the game and a lot of media extras to enjoy! 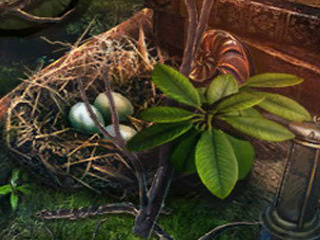 It is a nice ending to a good hidden object puzzle adventure series that has been with us for a while! This is Amaranthine Voyage: The Burning Sky review. Download this game here.